Dimensions 0.75 by 7 by 9.25 in. While many of these tools originated on UNIX, they are now available for a wide variety of platforms, including DOS/Windows and MacOS, so you can use them in your home environment. Additionally, many favorite programming languages offer regular-expression libraries, so you can include support for them in your own programs, and yes, even applets.There can be certain subtle, but valuable, ways to think when you're using regular expressions, and these can be taught. Jeffrey Friedl has spent years helping people on the Net understand and use regular expressions. 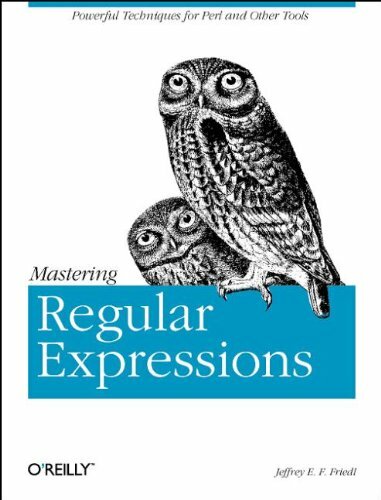 In this book he leads you through the steps of knowing exactly how to craft a regular expression to get the job done.Regular expressions are not used in a vacuum. In this book, a variety of tools are examined and used in an extensive array of examples, with a major focus on Perl. Perl is extremely well endowed with rich and expressive regular expressions. Yet what is power in the hands of an expert can be fraught with peril for the unwary. This book will help you navigate the minefield to becoming an expert.